Sotheby’s sale of Aboriginal art in Melbourne on Monday is estimated at A$3.79m but the lead lot is a drawing made by an Aboriginal leader, William Barak, of a corroboree–a ceremonial meeting. The drawing is the second-largest work created by Barak and of great relevance to Victorians — Barak was the head of the Wurundjeri people and the Coranderrk mission. Poignantly, he drew the corroboree on the back of a Christian poster listing the gospel readings for Holy Week. Although Barak adopted the Christian faith, he never relinquished his traditional culture and was an influential spokesman for the rights of his people. 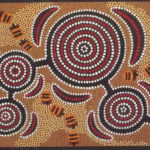 His drawings of sacred ceremonies and spiritual stories were important in helping non-indigenous people understand traditional Aboriginal ways. In 1895, Barak gave Corroboree to his friend Mrs G. M. Davies, who owned a property near Coranderrk, where he would often camp. The drawing was last sold by Sotheby’s in Sydney in 1998 for $74,000, more than double its lower estimate of $30,000. The estimate now is $180,000-$250,000. “In 1998, there was very little awareness with regard to Barak by the general public, there had been no retrospective (on him) at the National Gallery of Victoria, there was no William Barak Bridge. He is now far more widely known and revered,” Mr Klingender said.